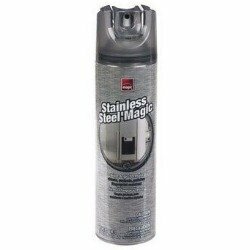 Danielle has shared her Stainless Steel Magic review, which is a stainless steel cleaner. For many surfaces any cleaner could be used, but for stainless steel surfaces I think a specially formulated cleaner gives the perfect streak-free glowing appearance. I personally use Stainless Steel Magic, which is a product made by Magic American Products in Ohio. I recently discovered it in my neighborhood grocery store and now I swear by it. The product I used previously was a cream and it took a lot of elbow grease to get the required shine. This product sprays a light mist and only a little is needed. I use the wipe and go formula, that cleans, protects, polishes and is also fingerprint resistant. I use it every week, because in the course of any day, spilled water leaves very annoying marks on such a pretty surface. I spray a little, rub a bit, and it shines a lot. It doesn't come in different scents, just regular, but I like the scent just fine. I'm not actually sure how to describe the scent; maybe it has a hint of lemon? Whatever it is, I like it a lot. I definitely give this product my seal of approval. Thanks Danielle for your Stainless Steel Magic review. Has anyone else used this, or another product for cleaning your stainless steel in your home? If so, please share your stainless steel cleaners review here, or you can read other reviews that have already been submitted.